Love to Dance? Love to Perform? You'll Love Sparkle Squad! Welcoming dancers of all levels, this NEW Community Dance Performance Troupe is all about getting out in the town we love and doing what we adore = DANCING! Sparkle Squad is FUN, FLEXIBLE, and AFFORDABLE! ENJOY Parades, Festivals, Community Support = we're there for the fun! YOU can PERFORM = as much or as little as your agenda permits! FLEXIBLE class schedule = a perfect family fit! AFFORDABLE = eligibility is simply the cost of just one class/week plus a small flat participation fee ($25) - for the year! Your High Schooler wants to be involved in their school sports/activities. Your High Schooler wants to continue their dance training. Your High Schooler wants to continue to participate in dance competitions. WE HAVE THE ANSWER! Our Life of a High Schooler Friendly Dream Team! We understand many of our High School age dance families seek a flexible selection of competition qualifying classes to balance school activities and we present that opportunity while continuing our dedication to the integrity of a driven educational standard of technical progression and inclusion in all areas. 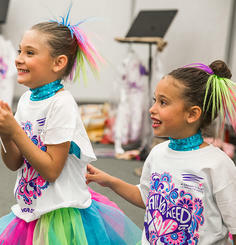 ALL Tween/Sr Dream Teamers are required to attend Monday Cecchetti Ballet plus at least one additional style-specific performance class of their choice which can easily be accomplished in a single afternoon/eve. Minimum weekly requirement: 2 classes = 2.75 hrs. To learn more about our Tween/Sr (High School) Dream Team see Class Descriptions. 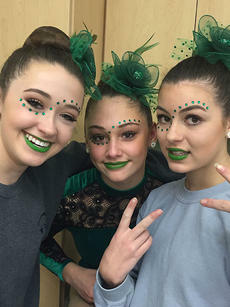 We’ve created a fun, supportive, and hardworking atmosphere within which our dancers train, perform, and compete in national dance competitions and community performances as a tightly knit group. You may guess that we spend a lot of time together. You bet we do! This is often a family affair as our team has become a gracious social environment that welcomes new members and their families with open arms. The educational aspects of our team program have been designed with a strong focus on technique, choreography, and performance. For those potentially interested in dance beyond High School, (college dance programming, college dance company &/or team, professional work, etc.) our "Add On" Dream Team format provides a focused curriculum to help you meet those goals. Additionally, our "All In" Dream Team programming continues to offer discounted tuition structure. This program is ideal for those VERY serious about their dancing, as we encourage our dancers to accept physical and emotional challenge. All dance company members must register for and maintain a committed attendance in their required team classes and rehearsals. Complete team information is available upon request. Pathways Conferences with our director are also welcomed to ensure new and returning team families have all of the information necessary to support and enjoy their dancer’s participation on our Dream Team. CLICK HERE for FALL 2018–2019 Weekly Class Hour Team Requirements = Pick Your Path! CLICK HERE for FULL SEASON 2018–2019 Team Requirements = soup to nuts, what's your commitment.